John Carpenter's classic Escape From New York is in the midst of getting the remake treatment over at 20th Century Fox. Or, at least we thought it was a remake. As it turns out the script that Luthor writer Neil Cross recently turned in is actually a prequel. From the start, it was reported that fox wanted to take the "Planet of the Apes" approach this movie. That franchise is currently doing prequels that are leading up to the events of the original and that now seems to be the case with Escape From New York as well. Bloody Disgusting broke the news that this new Escape From New York movie would actually be a prequel and not a remake. 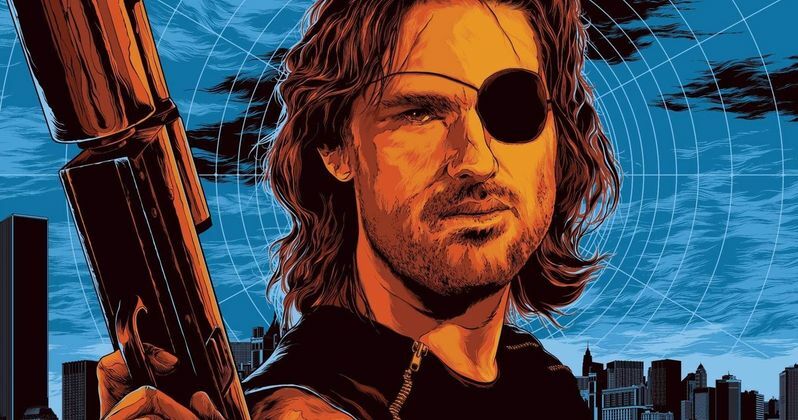 They also had another little bit of information to reveal about the movie, which is that Snake Plissken, the main character in the movie originally played by Kurt Russell, will not be wearing his iconic eyepatch. Since it is going to be a prequel, that may actually makes sense and it seems like we could be learning why Snake actually needs an eyepatch in the first place, which could be interesting. This first movie will reportedly set up an entire trilogy that leads up to the events of the original Escape From New York. The news from Bloody Disgusting should probably encourage fans, since the original is a major cult classic and would be hard to truly improve with a straight-up remake, save for updating some of the special effects. In addition to what Bloody Disgusting is reporting, The Wrap also recently revealed quite a few new details about the new Escape from New York movie, which actually make more sense now that we know it is going to be a prequel. For one, New York City won't be a prison as it was in the original. Here is how The Wrap describes it. "In the reboot, New York is breathtakingly lovely. Manhattan is the island we know, but with more towering glass structures and a high, undulating glass wall. The sky is alive with drones as serene as bees, and artificial intelligence controls all in the form of an ethnically ambiguous, cheery young woman called April. A small staff of technicians and researchers known as "Seers" monitor all." Other newly revealed details include that we will learn Snake Plissken's real name, there will be a new villain named Thomas Newton, the whole world will be in a state of chaos, the role of Hauk will be gender-swapped and the movie will start in another city somewhere outside of the U.S. There will also be a massive hurricane named "Superstorm Ellery" looming and the security system that monitors the city will have some vulnerabilities and will put the whole city at risk. Snake will reportedly only have 11 hours to accomplish his mission in this movie, as opposed to the 22 he was given in the original Escape From New York. The original Escape From New York follows Kurt Russell's iconic character Snake Plissken. It is set in an apocalyptic future where Manhattan has been turned into an island-sized maximum security prison. Snake is sent in to rescue the President of the United States, who has crashed into this ruined and chaotic city. The original movie was set in 1997 and since it came out in 1981, 1997 seemed like a pretty distant future. No word on when this new movie will take place or more importantly, who will replace Kurt Russell as Plissken. Fox has not set a release date for the movie yet, but we do know that John Carpenter will serve as an Executive Producer, with Andrew Rona and The Picture Company, also producing. We will be sure to keep you up to date as more details become available.